The following is a list of links to various politicians and political entities that you may wish to contact regarding Social Security or anything else of concern to you. We included the White House, the House of Representatives (including the leadership positions and the Progressive and Tea Party Caucuses,) the Senate (including leadership positions,) and the Democratic and Republican National Committees. I have tested all the links and as of the date of this post they are good. If anyone encounters a bad link or a bad telephone number, please let me know. We strongly urge all of our readers to contact at the least their own representatives and any others they want to. It is your right to “petition government for a redress of grievances” but please remember to do so politely, and never be threatening. Let them know what you think about what they are doing and what you would like them to do. It’s painless. I contact various people all the time. Please join us in this. Web page contact form: www.whitehouse.gov/contact. Switchboard: 1-202-225-3121. You can call this number to reach any Representative’s or Senator’s office in the Capitol. The column on the left defaults to “Representative” but there are several choices. The column on the right has three choices. 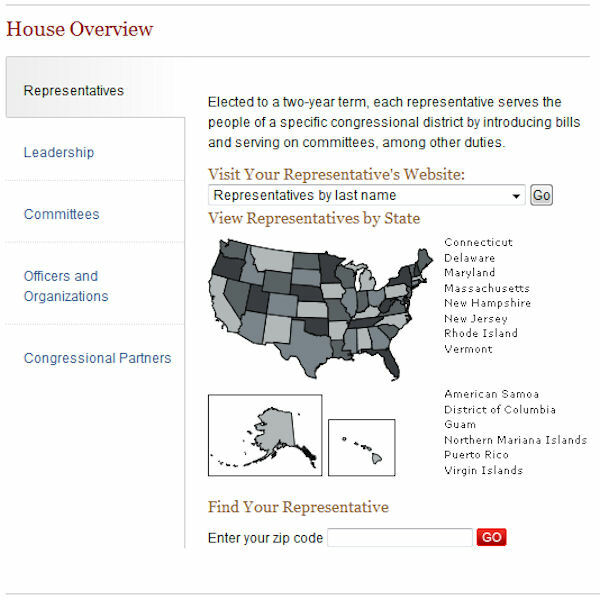 The first allows you to select a Representative’s Website from a drop down list of names. Most Representatives have a webpage, and you would use this to contact them in writing. The second and third choices allow you to find your Representative either by state (click the appropriate state), or by zip code. Many states have recently redistricted, so it’s possible that your Representative may have changed. I would suggest using zip code the first time you try this to make sure you are contacting the right Representative. The phone numbers to the Representative’s district office(s) can be found on his or her individual webpages. You have to enter your zip code to start. If you aren’t in her district, it won’t allow you to send a message to her personally. A zip code which is in her district is 94103. Once you get to the contact page, you have to enter your name, address, and email address. Here is an address in her district: 1655 Bryant St, San Francisco, CA 94103. This is the address of the Post Office a short distance from her district office. You have to enter your zip code to start. If you aren’t in her district, it won’t allow you to send a message to her personally. A zip codes which is in her district is 56387. Once you get to the contact page, you have to enter your name, address, phone number, and email address. Here is an address in her district: 110 1st St S, Sauk Rapids, MN 56379. This is the address of the Post Office a short distance from her district office. A phone number you can use is (608) 643-3631. This is the number for a nearby McDonalds. There is no other contact information for the Tea Party Caucus. In the upper right corner of the home page is a little box labeled “Find Your Senators.” Click the down arrow and you’ll be given a drop down list of states. Select a state, then click the button labeled “GO.” You will be given a list of that state’s two Senators. The names are links — clicking the name will take you to that Senator’s own webpage. Also shown for each Senator is his or her Capitol phone number and an entry called “Web Form” followed by a link. Click the link and you will be taken to the page you need to contact the Senator in writing. The phone numbers to the Senator’s district offices in his or her state can be found on his or her individual webpages.